This new edition of Collins Pocket Dictionary and Thesaurus ensures you'll always have the words you need at your fingertips. 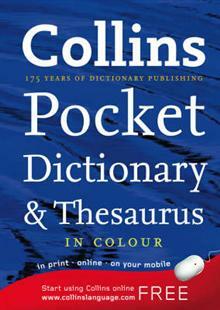 With matching dictionary and thesaurus entries on the same page, you'll never be stuck for words again! 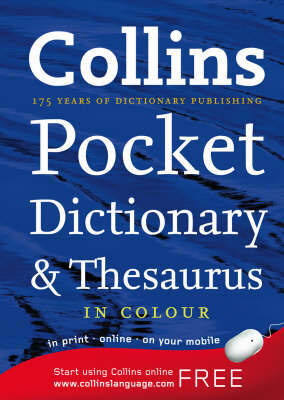 With all the main entry words shown in colour, Collins Pocket Dictionary and Thesaurus is easy on the eye and will help you find all the words, definitions and alternatives you need -- and fast. Clear, straightforward definitions reflect today's language, while the matching thesaurus entries provide a generous choice of synonyms and antonyms. And you can always rely on Collins to provide you with today's English as all our definitions, examples, idioms and usage notes are based on the Collins Word Web -- our unrivalled and constantly updated 2.5-billion-word database. Also contained is a handy supplement offering practical guidance to help improve your English. So if you're looking to write more effective letters or to craft a successful CV, the 'Write for Life' supplement will help you do just that, making this Pocket Edition of the Collins English Dictionary & Thesaurus the perfect one-stop English resource.